Content: there were a lot of f-bombs (I didn’t count them) that came up once at the concentration camp (understandable) and other mild swearing throughout. Also a number of disturbing images and content (Nazi concentration camps don’t make for Light Reading). It is most definitely one I wouldn’t hand to a kid under the age of 13 or 14 (depending on their maturity handling Difficult Situation), whether or not they were on the reading level, so it’s shelved in my Teen section (grades 9-12) at the bookstore. I don’t quite know where to start with this one. Once I discovered it was a Holocaust novel (as opposed to just a WWII novel), I put off reading it. I don’t like Holocaust novels, mostly because I don’t like being confronted with the evil things the Nazis did. But, because it was Elizabeth Wein, and because it’s a companion to Code Name Verity, I bravely gave it a shot. And I found myself sucked into the world of women pilots, of strong, resilient women who know how to survive. It’s odd to say this about a Holocaust book, but I loved it. Rose Justice is an American who has pulled strings to get enlisted as a transport pilot for the RAF. She’s doing her duty, blissfully unaware of the evils of the Nazis. Sure, they’re the Enemy, but the can’t be as horrible as they all say, right? Then, on a mission, she chases after a flying bomb (German pilotless planes loaded with bombs), gets lost over enemy territory, and ends up in Ravensbrück. Even I, who actively avoids anything Holocaust, know about the horrors of Ravensbrück. And yet, even though Wein captures the horrors, and the crimes, and the terribleness (I can’t seem to find a word strong enough) of Ravensbrück, it isn’t a hopeless, dark book. Even though Rose is changed permanently by her six months (only six measly months! How did people survive years there? ), she retains her will to survive. And Wein has created a cohort of strong, amazing, wonderful (again, there is no word strong enough) women who do just that: survive. It’s amazing — and inspiring — to read. I really enjoyed this one too. And I enjoyed your review. 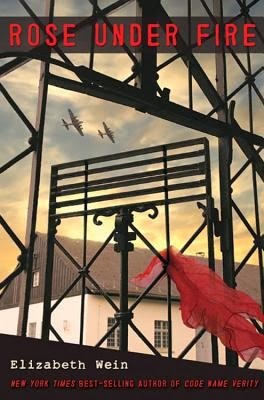 I liked it because it was a different aspect of the Holocaust, and the characters were so well written. I definitely recommend this one too.